The Paraná River (Río Paraná in Spanish, Rio Paraná in Portuguese) is a river in south-central South America, running through Brazil, Paraguay, and Argentina. This river, together with its tributaries, forms the larger of the two river systems that drain into the Río de la Plata. It is 3,032 miles (4,880 kilometers) long and extends from the confluence of the Grande and Paranaíba rivers in southern Brazil, running generally southwestward for most of its course, before turning southeastward to drain into the Río de la Plata. The Paraguay-Paraná river system covers an area of almost 1 million square miles, making it the second largest river system in South America, outranked only by the Amazon River. Along the Paraná's course is the impressive Itaipu Dam, the largest hydroelectric power station in the world, which creates a massive, shallow reservoir behind it. Famous with sports fishermen worldwide for its dorado, the "Father of the Waters" supports 355 species of fish. The surubí and sábalo species in particular are a popular export. The first European to travel the "Father of the Waters" (from the Guaraní language) was Sebastian Cabot in 1526. In 1525 Cabot assumed charge of a three-ship Spanish expedition intended to develop trade with the Orient. However, he diverted the expedition to the South American continent due to reports of fabulous wealth in the Río de la Plata region. After three years of what was considered fruitless exploration, he returned to Spain where he was judged responsible for the failure of the expedition, and was banished to Africa. The Paraná soon after became the principle explorers' route into the interior of the South American continent. The Paraná, together with its tributaries, forms the larger of the two river systems that drain into the Río de la Plata. It is 3,032 miles (4,880 km) long and extends from the confluence of the Grande and Paranaíba rivers in southern Brazil, running generally southwestward for most of its course, before turning southeastward to drain into the Río de la Plata. The Paraná River is formed at the confluence of the Paranaíba and Grande rivers in southern Brazil. From the confluence the river flows in a generally southwestern direction for about 385 miles (619 km) before encountering the city of Saltos del Guaira, Paraguay. This was once the location of the Sete Quedas waterfall, where the Paraná fell over a series of seven cascades. This natural feature was said to rival the world-famous Iguazu Falls to the south. The falls were flooded, however, by the construction of the Itaipu Dam, which began operating in 1984. For the next approximately 118 miles (190 km) the Paraná flows southward and forms a natural boundary between Paraguay and Brazil until the confluence with the Iguazu River. Shortly upstream from this confluence, however, the river is dammed by the impressive Itaipu Dam, the largest hydroelectric power station in the world, which created a massive, shallow reservoir behind it. 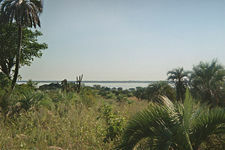 Overlooking the Paraná River from Encarnación, Paraguay. Across the river is downtown Posadas, Argentina. After merging with the Iguazu, the Paraná then becomes the natural border between Paraguay and Argentina. The river continues its general southward course for about 291 miles (468 km) before making a gradual turn to the west for another 510 miles (820 km), and then encounters the Paraguay River, the largest tributary along the course of the river. Before this confluence the river passes through a second major hydroelectric project, the Yacyretá Dam, a joint project between Paraguay and Argentina. It is the second largest dam in the world. The massive reservoir formed by the project has been the source of a number of problems for people living along the river, most notably the poorer merchants and residents in the low-lying areas of Encarnación, a major city on the southern border of Paraguay. River levels rose dramatically upon completion of the dam, flooding out large sections of the city's lower areas. From the confluence with the Paraguay River, the Paraná again turns to the south for another approximately 510 miles (820 km) through Argentina, making a slow turn back to the east near the city of Rosario for the final stretch of less than 311 miles (500 km) before merging with the Uruguay River to form the Río de la Plata and emptying into the Atlantic Ocean. During this part of its course, downstream from the city of Diamante in the province of Entre Ríos, it splits into several arms and forms the Paraná Delta, a long flood plain which reaches up to 39 miles (60 km) in width. The Paraná River is divided into four sections, the Upper, High, Middle, and Lower. 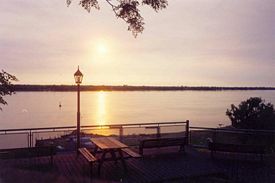 The Upper Paraná River includes about one-third of the Paraná River Basin and is located completely in Brazil with the exception of a stretch within the Itaipu Reservoir, which borders Paraguay. The floodplain of this section is 143 miles (230 km) and starts from the Porto Primavera Dam and runs to the upper portion of the Itaipu Reservoir. There are no dams along this stretch, which makes it favorable for migratory fish to complete their life cycles. The three types of habitats fish need to flourish are spawning, nursery, and feeding. The carnivorous characiformes species, such as piranha, prefer spawning in turbulent shallow water of 10 feet (3 m) on rocky riverbeds and often spawn during floods, usually from October to January. Siluriformes, such as catfish, spawn from December to March and prefer quieter waters with sandy river bottoms. The nursery habitats are lagoons of the lower parts of the tributaries. Studies have suggested that lagoons are the richest in diversity and abundance of phytoplankton and macrophytes. The feeding habitats for adult fish are located throughout the Upper Paraná, the main river channel, meandering rivers and tributaries, rapid rivers, and the Itaipu Reservoir. The High Paraná section of the river begins at the Itaipu Dam and ends at the tri-national border of Brazil, Argentina, and Paraguay. This portion of the river is 1,208 miles (1,944 km) and flows southwest and then west along the borders of Paraguay and Argentina from the Iguaçu River. The controversial Yacyretá Dam is in the mid-section of the High Paraná and has 20 turbines with a power of 4,050 MW that can produce 19,080 GWh per year. It is equipped with two fish elevators to allow fish to go upstream during the reproductive season. This Middle portion of the Paraná begins where it meets the Paraguay River at Corrientes and turns south to run through Argentina. Here it is a typical plains river with numerous islands. The Lower portion starts at Santa Fé where the last tributary, the Salado River, merges. Due to the constant erosion of the west bank, which is higher than the east bank, the water is turbid and divided into many branches. The delta starts at Diamante where the river turns southeast for the final 199 miles (320 km) into the Río de la Plata. The world's only river delta that is in contact not with the sea but with another river, the Delta of the Paraná, is an extensive wetland that provides a vital ecosystem for a wide variety of plant and animal species, such as the marsh deer, pampas cat, and jaguar. These wetlands also play an important role in the regional hydrology and water quality. The area is important to the regional economy as well because of extensive forest plantations of mainly willow and poplar trees, which thrive in the delta environment. Sustainable development of the delta region rests upon maintaining the biodiversity and overall health of the ecosystem, as well as long-term management of the forest industry. The Lower Delta was the site of the first modern settlements in the Paraná-Plata basin and is today densely populated, being the agricultural and industrial core of Argentina and host to several major ports. 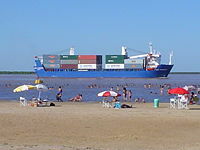 The main course of the Paraná lies on the west of the delta, and is navigable downstream from Puerto General San Martín by ships up to the Panamax type. The Paraná along with its tributaries creates a massive watershed that spreads throughout much of the south-central part of the continent, essentially encompassing all of Paraguay, much of southern Brazil, northern Argentina, and even reaching into Bolivia. If the Uruguay River is counted as a tributary to the Paraná, this watershed extends to cover much of Uruguay as well. The volume of water flowing into the Atlantic Ocean through the Río de la Plata is roughly equal to the volume at the Mississippi River delta. This watershed services a number of large cities, including Buenos Aires, Asunción, and Brasília. The Paraná and its tributaries are a source of income and even daily sustenance for numerous fishermen who live along its banks. Some fish species, such as the surubí, which reach four feet (130 cm) in length and the sábalo, which average about two feet in length, are commercially important and are exploited for massive regional consumption or for export. The sábalo is a key species of the river as it forms the base of the food chain that ends with larger fish like the surubí. To sustain a continued supply of the species, experts recommend maintaining an upper-limit catch of 20,000 tons; however, in 2004, 34,000 tons were exported. In an attempt to facilitate the reproduction of the sábalo, Argentina’s national government banned the export of fish of the Paraná River for eight months beginning January 1, 2007. 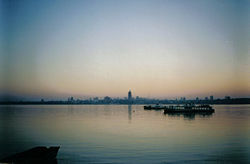 Much of the length of the Paraná is navigable and is used as an important waterway linking inland cities in Argentina and Paraguay to the ocean, providing deep-water ports in many of these cities. The construction of massive hydroelectric dams along the river’s length has blocked its use as a shipping corridor to cities further upstream, but the economic impact of those dams is considered to offset this. The Yacyretá and Itaipú dams on the Paraguay border have made the small, largely undeveloped nation the world’s largest exporter of hydroelectric power. The Paraná River snakes through the Atlantic Forest, which at one time spanned 330 million acres, an area twice the size of Texas in the United States, and ranged across eastern Brazil into northern Argentina and eastern Paraguay. Only seven percent of this forest remains today. 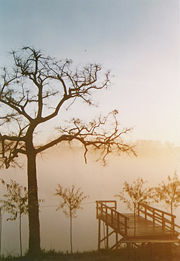 The waters of the Paraná have become murky, clouded with sediment washed from upstream. Scientists have determined that one of the main culprits was the rapid deforestation of the Atlantic Forest. With the loss of forested areas along streams that feed the Paraná, no buffer remained to filter sediment from water destined for the Paraná. The health of great rivers is affected by the lands that surround them. Changes in land management can result in diminished water quality and new water-flow patterns; both are considered major threats to plant and animal life. Restoring buffers along streams is one land-management technique that improves water quality, a benefit to people downstream who depend on the river for drinking water. Large-scale reforestation is underway in the forest in order to restore the river's health. This is being undertaken by The Nature Conservancy in conjunction with Brazil's water agencies. Data is being examined to determine where restoration will be most effective and strategic. Currently, there is strong support among water agencies in the Paraíba do Sul, Piracicaba Capivari and the Iguaçu watersheds. Farmers and ranchers, many of whom settled the newly cleared lands, are being encouraged to use best practices and adhere to an environmental law that requires 20 percent of their lands to be forested. San Roque González de Santa Cruz Bridge, between Posadas, capital of Misiones Province, Argentina and Encarnación, Paraguay, capital of the Paraguayan department of Itapúa. General Belgrano Bridge between Resistencia (capital of Chaco) and Corrientes (capital of Corrientes). Hernandarias Subfluvial Tunnel, which runs under the river between Santa Fé (capital of Santa Fé) and Paraná (capital of Entre Ríos). Rosario-Victoria Bridge between Rosario, Santa Fé, and Victoria, Entre Ríos. Zárate-Brazo Largo Bridge between Zárate, Buenos Aires and Brazo Largo, Entre Ríos. Additionally, a bridge between Reconquista, Santa Fé and Goya, Corrientes is under study. 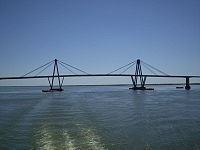 Also, joint studies have been underway, carried out by the governments of Uruguay and Argentina, for the construction of a bridge between the two countries over the Río de La Plata estuary, the exact location undecided. ↑ Encyclopedia Britannica. 2007. Sebastian Cabot. Encyclopedia Britannica Online. Retrieved April 12, 2007. ↑ Encyclopedia Britannica. 2007. Río de la Plata Physical Features. Encyclopedia Britannica Online. Retrieved April 12, 2007. ↑ Preserving Links between Watersheds and Rivers. The Nature Conservancy. Retrieved April 13, 2007. Kaul Grünwald, Guillermo, and Mary H. Jackson. 1966. "For Our River Parana." Northwest Missouri State College Studies, v. 30, no. 4. Maryville, Mo: Northwest Missouri State College. This page was last modified on 8 July 2013, at 15:05.